Your body changes in many ways during pregnancy. 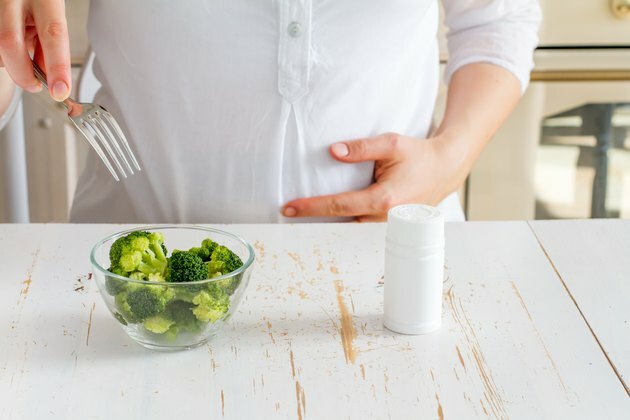 One of the changes that might be quite apparent from the very beginning of pregnancy is that your digestive tract slows down significantly to help you extract nutrients from your food. Unfortunately, this can lead to uncomfortable bloating and gas after eating. During pregnancy, hormones slow down your digestive tract. This keeps food in the intestine longer, which allows you to maximize the efficiency of your digestion and absorption process. As a result, you pull more nutrients out of your food and absorb them into your bloodstream than you ordinarily would. The longer food remains in the digestive tract, however, the more likely you are to experience bloating, gas, constipation and other digestive disorders. The sensation of bloating comes from the formation of gas in the intestine. Your intestine contains many native -- meaning naturally-occurring and non-pathogenic -- bacteria. They survive by digesting the indigestible bits of food that pass through your system. As they digest this food material, however, they produce gaseous byproducts that collect in your intestine, leading to formation of gas bubbles and the feeling of gas or bloating. Your slow intestine during pregnancy allows bacteria to digest a large quantity of food material and thus form a large quantity of gas. Another reason that you might experience bloating after eating is if you're using a prenatal vitamin with your meals. Prenatal vitamins contain a large quantity of iron, which exacerbates the pregnancy-related slowing of the digestive tract, explain Heidi Murkoff and Sharon Mazel in their book "What To Expect When You're Expecting." You might experience less bloating if you cut your prenatal vitamin in half and take it at separate times. While it's difficult to avoid digestive slowdown during pregnancy, you can reduce bloating by keeping your digestive system as functional as possible. Drinking plenty of water helps speed up the digestive process and can reduce gas formation. Also, even though bacteria can digest fiber and produce gas and bloating, fiber also helps your digestive tract work more efficiently, explain Drs. Michael Roizen and Mehmet Oz in their book "You: Having A Baby." Fiber-rich foods include fruits, vegetables and whole grains. If you've tried adjusting your diet but still are experiencing uncomfortable bloating after eating, try talking to your obstetrician. While each doctor is different, many will allow you to use simethicone, an over-the-counter gas relief agent, during pregnancy. Simethicone helps to break up gas bubbles and reduces the feeling of bloating, which will provide you with some symptom relief, explain Drs. Roizen and Oz.